An easy-to-read writing style guide that builds the knowledge you need for leadership and management roles. 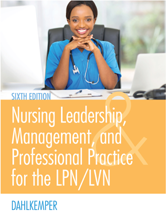 This title helps readers to make a successful transition from student to professional while still focusing on the humanistic aspects of caring. Where Is the Licensed Practical Nurse in This Historical Picture?